Yes, you’re reading that right. A front-wheel drive Ford Explorer. I’m not going to lie – I went into this test drive with significant skepticism. I reviewed a pretty sweet, loaded up Explorer Limited last year, and came away quite impressed. 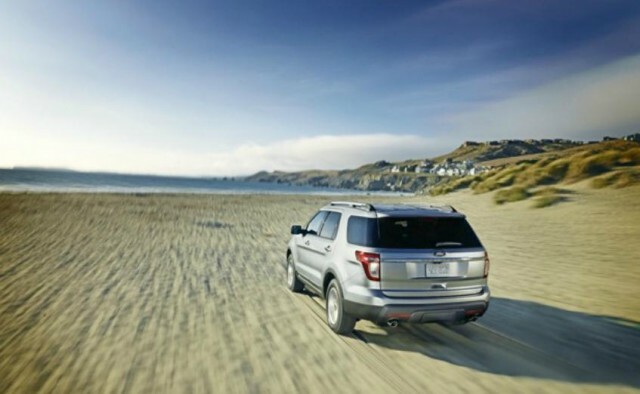 The base Explorer starts at CDN $29,999, which is the V-6 powered front-wheel drive model. Step up to this model, and you’re starting at CDN $41,449. Yikes. Add on the goodies I’m going to talk about, and you’re looking at CDN $49,979. Yowzers. That’s pricey, but you get a lot of stuff. If you’re interested in my thoughts on the V-6 powered, all-wheel drive version of this vehicle, please click here to peruse my thoughts on the Explorer Limited. This Explorer is the EcoBoost. That’s Ford-speak for direct injection and turbocharging. They’ve found exceptional success with their EcoBoost V6 engines – in their bigger cars (Lincolns too) and most importantly for their bottom-line, in their trucks. A big percentage of all F-150s sold now are sold with the EcoBoost V6 – and that’s no mean feat, because it’s a very big-selling vehicle. I mean, it’s their bread and butter, so they are moving a lot of them. However, this isn’t that EcoBoost. And that’s what piqued my first twinge of skepticism. I was told I was getting the 2.0 Litre, 4-cylinder EcoBoost!!! WHAT?! A little 4-cylinder trying to muster up enough jam to motivate this enormous land-leviathan? As noted in my other review, this generation of Explorer is the biggest one they’ve built to date. How on earth could they put a 4-cylinder in it? 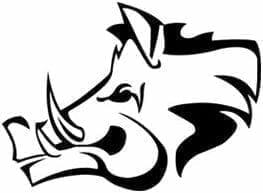 Even a turbocharged one? Well, here are the numbers, and they start to apply a little salve to my chapped rear. The 2.0 Litre EcoBoost puts out 240 HP @ 5,500 RPM – it’s down 50 HP from the V6. Not great, but not horrifying. Ah, yes, BUT it does churn out 270 lb.-ft. @ 3,000 RPM. That, my friends, is 15 lb. ft more than the V6, and it’s available at 1100 RPM less than where the V6 offers it up. And that makes all the difference. In North America, we like our torque. Our driving requires it. We don’t open our cars up to top the 200 km/h mark very often, but we sure like getting from one red light to the next in a big hurry. Horsepower doesn’t make a big difference there – certainly not as much as torque does. And this little engine has torque in spades. 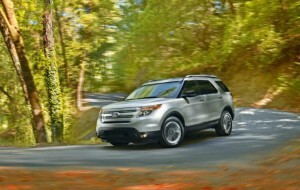 The EcoBoost Explorer is rated at 10.4 L/100 km (23 mpg) in the city and 7.0 L/100 km (33.6 mpg) on the highway. Those are respectable numbers for a behemoth like this. Over a week of not particularly economical driving, with mostly city commuting and a slightly heavy foot to explore that torque, I saw 12.9 L/100 km (18 mpg). That’s not bad. Not terribly exciting, but really not bad, considering the same size vehicle with lesser performance would have been getting far worse mileage only a couple of years ago. Let’s talk briefly about the drivetrain. This generation of Explorer shares a platform with front-wheel drive cars – there’s nothing wrong with that, because that’s how most of us want our big SUVs to behave anyway. Do you really know anybody who takes their SUV off-road? Me neither. But I was a bit taken aback to find out Ford only offers the EcoBoost in a front-wheel drive package. So there you have it. A 4-cylinder, front-wheel drive Ford Explorer. Henry isn’t spinning in his grave quite yet, as this turned out to be a great vehicle. This new generation of Explorer has been completely rethought and in my opinion, it looks good. This vehicle can look sleek, it can look boxy and it can look enormous, depending on which angle you’re looking at it from. The front grille is the strongest styling feature, in my opinion. It has horizontal slats, accented with chrome – you can’t miss it. Otherwise, the overall shape is built out of boxes, but they’ve managed to modernize it and make it somewhat sleeker-looking, slightly hiding the fact that it’s a big vehicle. It has a high beltline, making the bottom of the vehicle look bigger and the windows smaller. 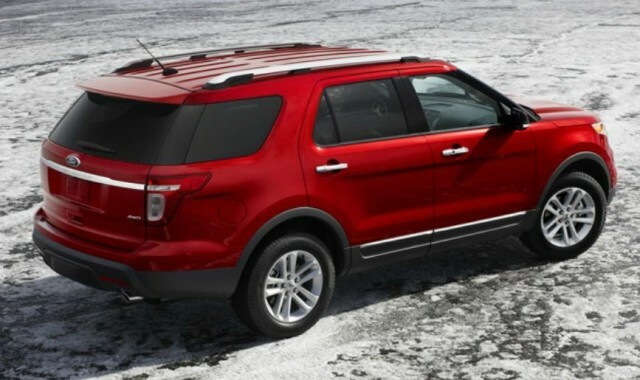 Ford retained the faux wrap-around rear side windows that have become an Explorer trademark – they look good on this one. Another thing you can’t miss on this particular trim level is the meaty 255-50/20 rubber wrapped around great-looking 20″ chrome wheels. The whole package comes off as a relatively clean design, in my opinion, and considering the size and heft of this vehicle, it is done well. The front and middle row seats are a lovely perforated leather. Both front seats are heated and cooled, and 10-way power adjustable and were very comfortable. They offer little bolstering on the sides, but that’s acceptable, in my opinion, because this vehicle wasn’t designed to be driven aggressively. 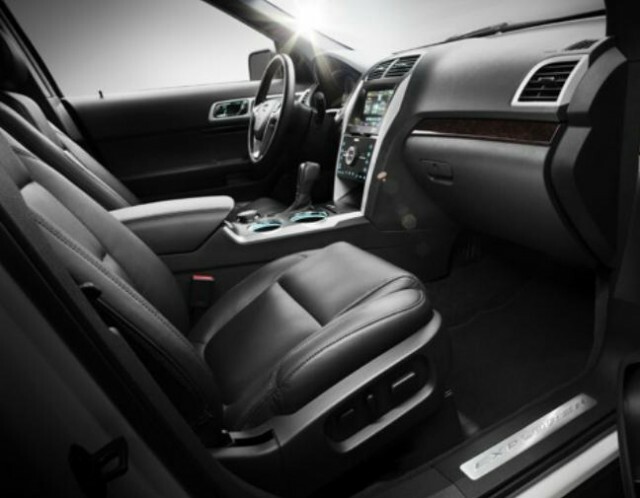 The driver’s seat includes 3 memory settings as well as a power lumbar adjustment. The leg room/knee room was good for front and middle-row passengers, but perhaps less than you might think. I found the bulk of the steering column area intruded into the knee room for the driver. The third row’s knee room is acceptable and will do for kids. The issue is the foot room in that third row. The tracks for the second row of seating intrude into what little space you have to put your feet down on the floor. My kids, on the other hand, have legs that don’t reach to the floor and they were just fine and very comfortable back there. Headroom is fantastic in this vehicle, even with the two moon roofs looming overhead. The third row seats have these neat scalloped indentations above them to afford the passengers more headroom back there. The interior is done well. The plastics look nice from a visual perspective, and are nice soft-touch materials. Ford uses a cool LED lighting scheme, and I thought it looked good. 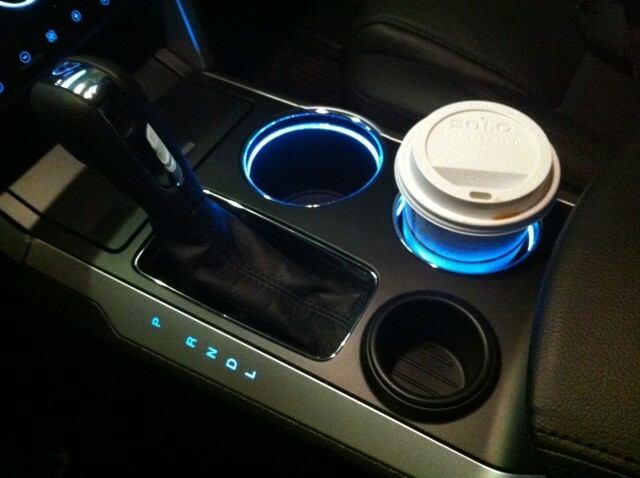 There are neat little touches, like the blue/red lit-up rings around the center console cupholders. This vehicle had a dark wood trim – it’s nice, but so dark that it barely differentiates itself from the black plastics around it. The fit and finish seems to be excellent – Ford is paying attention to build quality and gap tolerances are very good. There were no squeaks or rattles of any kind. Storage-wise, the Explorer does well. There are center console bins for the front and middle rows – both are deep and very usable. The glove compartment is roomy and has two levels. There are a number of well-designed door bins in all four doors. The third row has well thought-out organizers/trays, complemented with a cupholder, on both sides. Speaking of cupholders, you’ve got two cupholders in the front doors, as well as two in the center console for both the front and the middle row. The rear liftgate is powered, and can be controlled from the driver’s seat, from the rear liftgate itself or from the key FOB. 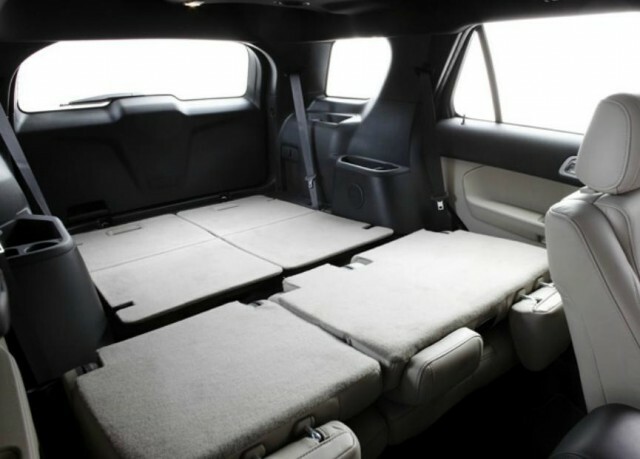 Cargo volume is rated at 21 cubic feet, which is decent – this increases to 44 cubic feet with the seats folded down, and it is a significant amount of space. There are a decent array of solid-looking pivoting cargo hooks in the rear area. Speaking of folded seats, the rear seats (with the luxury seating package) have a cluster of buttons controlling them from the back of the vehicle. It allows for 3 different positions – 1) normal, which is upright for seating purposes; 2) fold, which folds that rear row forward, creating a bigger cargo area; and 3) stow, which is an excellent option – it partially folds the seats together flat, and them tumbles them backwards into a well situated in the cargo floor area, making for a massive cargo area with a nice flat floor. To make this cool power option even more flexible, it allows you to apply your choice to either the left, the right or both rear seats. This was a great way to impress passengers. I’ve linked to my short, poorly-made video of the stow mode if you’re interested in seeing it in action – it creates a great cargo area very quickly. I also appreciated the bin where you’d normally find an ashtray at the front of the center console – it is lidded, and provides ample space for little extras, including connected media devices. This Explorer uses the MyFord system – an all-encompassing system controlling the vehicle’s climate control, audio system, phone integration and navigation system – all through a central touch-screen. The screen can be divided into 4 quadrants, allowing you to access the basics of each area, or you can zoom in on any quadrant, taking up the whole screen for that particular function. From there, the screen may change as you progress through menus, functions, etc. The basics of whatever the screen is showing can be seen in the right one of two 4″ LCD screens flanking your speedometer. For example, if you’re listening to the radio, you’ll get all the information you want and more on the main screen, but up on the dash, you’ll see the song, artist and radio station. As mentioned, there are two 4″ LCD screens flanking the speedometer. The left one has vehicle information in it – which is highly adjustable and controllable by the driver. It can handle driving range, fuel economy in a variety of ways, tach, gas gauge, temperature gauge, trip computers, vehicle settings and controls the driver assist systems. The content and control of both screens are handled by a four-way control pad with an OK button in the centre – one on each side of the steering wheel corresponding to each screen. The concept is fantastic but the way it works isn’t always fantastic. At times, I found myself wanting this system to react quicker to my touch but it seems this has improved. Another issue is that it takes longer to get to some of the functions that I wanted to access immediately. Want to turn on your seat heater? You’re a few screens away from that. Want to get to your phone’s contact list? You’re a few screens away from that. It does so much, yet it takes significant effort to dig down through the layers of offerings that I found it got irritating at times. Media sources include AM, FM, satellite, CD, up to 2 USB devices, Bluetooth streaming, and even an SD card. The sound system itself is a Sony-branded system, playing through 12 speakers in the Limited trim level – including a center channel and a subwoofer in the back. I have to say this is one of the better sounding systems I’ve heard. Many of the systems functions are buried in the MyFord screen-based system, but a few of the elementary controls such as volume, seek, scan, etc are done with a rotary dial around a directional pad just below the screen. This model comes with a hands-free FOB – as long as you have it on your person, your touch will unlock the doors and allow you to use the push-button start/stop ignition. The FOB also has a remote starter, which is a nice bonus. You’ll find four 12 volt plugs spread around the cabin, and a very useful 110 V household plug-in at the back of the front center console, in front of the second row. Right above that, you’ll find excellent temperature controls for the back, which can also be locked out to be solely controlled at the front if you want to be a control freak. This rear climate control panel complements ceiling-mounted A/C vents, which is a nice touch taken from minivans. Those ceiling vents do a significantly better job at cooling down a hot vehicle. Side-view mirrors are power-folding. It has the Homelink transmitter system, allowing you to program your garage door opener codes – up to three different ones. This vehicle came equipped with the dual moon roof option – the front one allows for power tilt and slide, and there is a power sliding cover for both the front and the back moon roof. These roofs allow a lot of light to come in and certainly brighten the interior. When it comes to safety tech, the Explorer is well-equipped. It has the collision avoidance system, which lights a row of very bright red LEDs on the dash and sounds a very loud alarm if it appears that you may hit a vehicle in front of you. It works at all speeds, including in parking lots, etc. It also has the adaptive cruise control which, of course, allows you to set the speed you want to travel at but also lets you define how much of a gap you want the system to maintain between you and the vehicle in front of you. If they slow down, so will you – you don’t need to intervene. The side view mirrors have integrated blind-spot information systems, in the form of an orange LED that glows when a vehicle is in your blind spot. 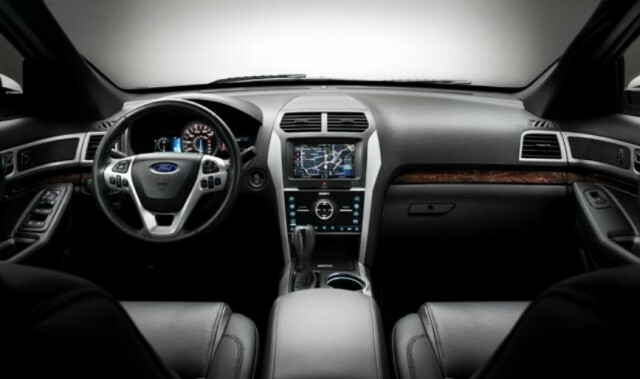 The MyFord screen also acts as a monitor for a very clear rear-view camera when you’re in reverse, and the picture includes your trajectory which changes as you turn your steering wheel which is very helpful in determining where you’ll end up. There is also an audible distance sensor for backing up. Driving this vehicle is very comfortable. The ride is excellent, although stiff enough that it doesn’t wallow around, including the corners. I, and a few of my passengers, were pleasantly surprised at this relative behemoth’s ability to negotiate corners quite quickly, without complaining. No screeching of tires, very little body roll. Considering the size of the vehicle and it’s weight and height, it handles very well. There is some thump over expansion joints and potholes, which is to be expected with the relatively low-profile rubber. I have been in vehicles where the cabin has been isolated from road noise better than this one, but it’s not a complaint. Because of the long hood, I always got the feeling that I’m swinging a very big front end around when I was making lower speed turns or parking the Explorer. It is difficult to tell where the actual front of the vehicle is and I found that took a while to get used to. I felt that the V-6 always gave the impression that it worked hard to get this big vehicle up to speed, and made a lot of noise doing so. I can honestly say that the 2.0L EcoBoost is better suited to this vehicle, at least for the kind of driving I did. It never felt as though it was working hard, and the torque was always there. When you’re at speed, the little engine does take a split second to build up boost, but the hesitation is no more than the V-6 provided, so it’s not a knock. If you keep your foot on it, the EcoBoost will surprise you with the gusto it brings to the table, and I was never disappointed in its performance. I even enjoyed the noises it made – it sounds more throaty than the V-6 did. The brakes are good, if not a bit grabby. Outward visibility when driving this vehicle is exceptionally good. The one thing I found that really impeded my outward visibility was when the third-row seat headrests were up. They are enormous and make up what seems to be the top 1/3 of the seats – being this huge, they can’t help but be in the way of seeing out of the back. One of the things I noticed immediately, and frankly I don’t think enough car manufacturers pay attention to this, is how wide all four doors open on the Explorer. I was duly impressed – the doors open very wide and stay open if you want them to. Getting into any of the four doors is very easy and roomy. That said, it has less wide detents too, if you don’t have a lot of space beside your Explorer. Well done! I evaluate vehicles for family friendliness, as I have three small kids in various sizes of child seats. We easily accommodated our 1 year old in his front-facing child seat, and our 4 year old and our 7 year old in their booster seats. Getting the kids in and out of the vehicle was a breeze. There are 2 sets of LATCH anchors in the second row, and one LATCH anchor set for the third row, allowing you to anchor a total of three child seats. My kids loved this vehicle! Just remember, you’ve got to tumble one of the second row seats forward to get to the back row. If you’ve read my other reviews, you know I often comment on the dead pedal. I always drive an automatic with my foot firmly placed on the dead pedal space. The Explorer has a dead pedal on the left side of the driver’s footwell where it belongs, but for some reason, the top left quarter of the dead pedal is cut off by an intrusion. I kept kicking this intrusion as my whole size 13 foot didn’t fit and it drove crazy, especially when cornering. I do take great issue with the fact that you can’t get all-wheel drive with this EcoBoost engine. I’m sure Ford has their reasons, but the EcoBoost has plenty of torque, and the combination would definitely make this a great winter vehicle. As it sits, I did find myself limited in some packed snow situations or on icy roads. It suffers from the same traction issues any front-wheel drive car would have, and that became irritating, considering you’re driving an SUV. If you checked out my review of the V-6 Explorer, you’ll remember the cool “Terrain Management System”. It was controlled with a very nifty console-mounted rotary knob behind the shift lever, allowing you to switch the system into optimized modes for different terrains: snow, sand, mud and a hill-descent mode. As cool as it is, I firmly believe that 99.9% of owners never will try it, never mind use it regularly. The front-wheel drive Explorer has done away with it, obviously, and has replaced it with a significantly more useful little storage cup – it’s perfect for change, or as a cupholder for those cute little espresso cups. Pinky up! 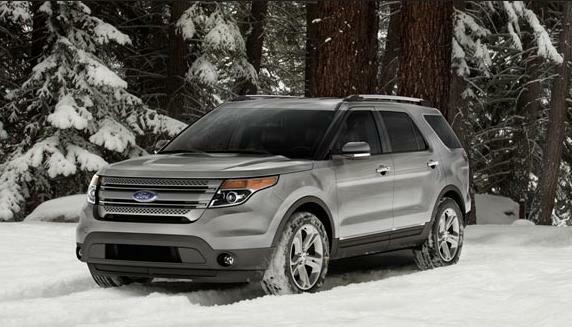 I really liked the 2012 Ford Explorer. Sure, it probably didn’t hurt that this was the Limited trim level, because any of the goodies I would want but maybe wouldn’t spring for if I was paying for them were included. But it was a great ride. It served me well. Shopping trips were easily accommodated, space-wise, while my whole family was in the vehicle. If you need room, and a lot of it, and you like that space to be flexible, this is a great vehicle. It was competent around town, and the fuel economy is acceptable considering the heft of this beast. It’s even a measurable improvement over the V-6 in terms of mileage. I would rate this vehicle, for my purposes, a 7 out of 10. With an all-wheel drive system, I would have given it an 8. I found it expensive at this trim level with these options, and clearly there are other options out there at that price. But it’s an excellent alternative and I wouldn’t hesitate recommending a closer look at one if you’re in the market for a bigger SUV or crossover. In regards to competence and utility, it did everything I asked of it, and that says a lot. WAF (Wife Acceptance Factor) was high – very high, in fact. She loved the space, the high seating position, the tech goodies and the luxury.